Aby Kate runs three classes a week Monday evening Pilates 8pm and Tuesday morning Fitsteps 9:45am & Yoga 11am. Friendly classes for men and woman of all ages and levels. Pilates class in Brown Edge, Stoke-on-Trent every Monday evening 8-9pm. Read more about my Pilates classes in Stoke-on-Trent. Fitsteps FAB is an inspiring dance based fitness class designed by ‘Strictly Come Dancing’ stars Natalie Lowe & Ian Waite and Olympic swimmer Mark Foster. Fitsteps FAB is ‘for all bodies’, for people who love to dance, want to keep fit, but for a variety of reasons, prefer a lighter intensity and lower impact workout. Incorporating a combination of graceful and up-tempo steps creates a class that improves cardio fitness, tones the body, and keeps the brain active and healthy. This Fitsteps FAB class fuses dance styles with swing and sway roots; such as the Charleston, Foxtrot and Swing Jive. And timeless dances such as Theatre Jazz and Disco, Flamenco to the dramatic Argentinian Tango. No partner needed. 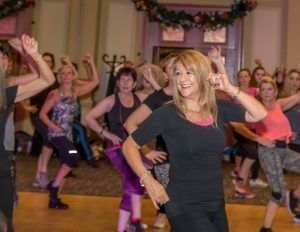 Read more about my Fitsteps FAB classes in Stoke-on-Trent. Yoga class in Brown Edge, Stoke-on-Trent every Tuesday morning 11-12noon. 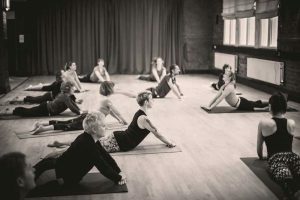 Aby is a qualified British Wheel of Yoga teacher and runs a slow-flow Hatha Yoga class at Stoke-on-Trent’s Brown Edge village hall, ideal for someone new to yoga, returning to yoga having had a break or someone who wants a class with a steadier pace. Using traditional poses (asanas), breathing techniques (pranayama) and concluding the session with a period of relaxation Aby creates a yoga class suitable for all levels. Read more about my Yoga classes in Stoke-on-Trent (as I also offer other yoga classes daytime and evening in and around Stoke-on-Trent including Vinyasa flow classes). To book a class in Brown Edge, Stoke-on-Trent, simply visit our contact page.